brown rice recipes collection. healthy brown rice recipes. Brown Rice is rice that is not milled or half milled, that is the outer layer of the grain is only partially removed or not removed at all. It is a whole grain as opposed to the white rice which is refined. Apart from this, there is also a difference in the health benefits of both. Brown rice is richer in nutrients like potassium, magnesium and phosphorus. It is also more fibrous than white rice and helps you feel full for a longer time coming to the conclusion that brown rice helps in weightloss! Hence it is a very good idea to introduce brown rice into your diet. A lot of people are confused as to how to cook Brown Rice, it is very easy! Brown rice is anyway healthy but we can make it even healthier depending on the other ingredients we add along with it. Mixed Sprouts Brown Rice Pulao is one such example where you can make a healthy thing even healthier. The combination of sprouted legumes and rice packs a protein punch which is fiber rich and can even be packed in a tiffin. Brown rice also makes a delicious Vegetable Biryani with minimal oil and a mix of different crunchy vegetables. Who says we can't enjoy our favorite rice dishes with brown rice! We absolutely can! Rajma chawal is every Punjabi's favorite food. It is spicy, flavorful and full of love and the only thing that makes it better it better if it were healthy! Rajma Brown Rice is not the exact copy of this classic, but it will nevertheless leave you satisfied and asking for more. Even Gujarati Stuffed Brinjal and Onion Khichdi tastes even better with brown rice. Just like this, many recipes form the Indian cuisine can be made with this wonder ingredient. Honestly once can switch all rice preparations made with white rice with brown rice. There is a little difference in the cooking time but it will taste just the same, just healthier. If you want to try something innovative, Palak Kofta Biryani is the recipe for you! Koftas add a nice zing to the rice and will be loved by all. A pulao made with south Indian flavors? Yes please. Cabbage Pulao is a delight that can be put together for those who really like South Indian food with a traditional tempering. These are all traditional rice dishes, but brown rice can also be used to make other delicacies that involve rice! Brown Rice Dosa is a crispy, nutritious version of the regular dosa with TWO types of dals! Brown Rice Neer Dosa as well, which is a Karnataka specialty, is extremely tasty. The texture is exactly like the original and gives a very homely feeling too! If all else fails, you can always just have plain cooked brown rice along with Masoor dal and enjoy the ever favorite Dal-Chawal. Just like I mentioned with Indian Cuisine, you an even use brown rice in various international recipes. From two types of Chinese dishes, Broccoli Fried Rice and Regular Fried Rice to maybe utilizing it in sushi, this grain is taking over the world. Asian cuisine is big on rice and this is the perfect way to make meals delicious! This rice can be used to make Risottos of different flavors or used as a stuffing in Baked Stuffed Capsicum! So many options! 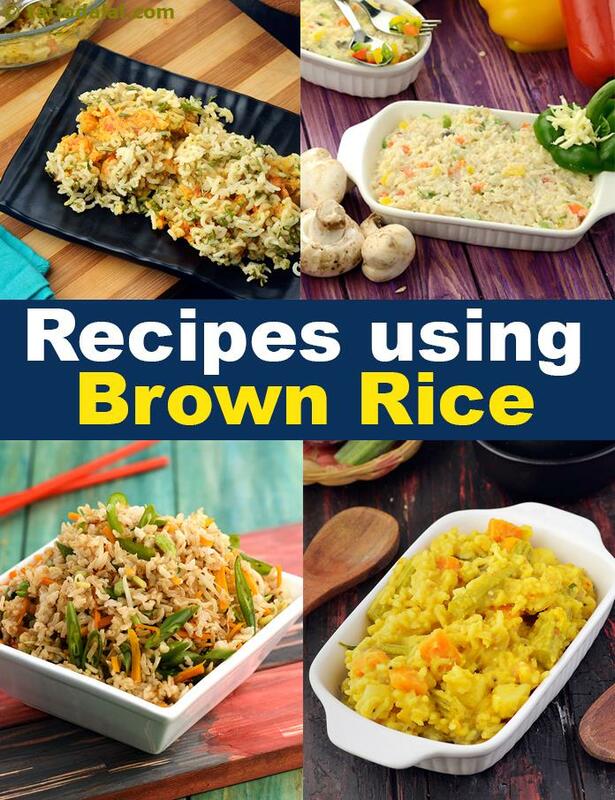 We hope you like this collection of brown rice recipes! Scroll below for more.